See the sparkles? 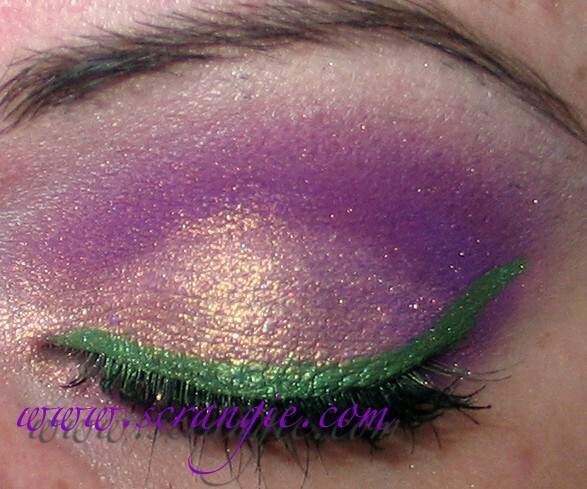 It's not really a very glittery glitter liner, but it does have some sparkle to it. It flakes if you apply too much, though. I prefer Too Faced's glitter liners over MAC, but sometimes MAC has really nice colors. Patina is a really nice shade. It's a really soft light brown with some read pearl in it, sort of duochrome-ish, you get the brown/tan base and then at some angles you get the red pearl. Very soft color. 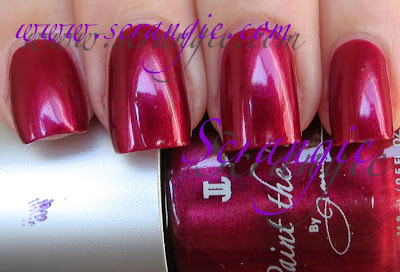 OPI's converted another one of their shades into a matte-finish Suede polish. 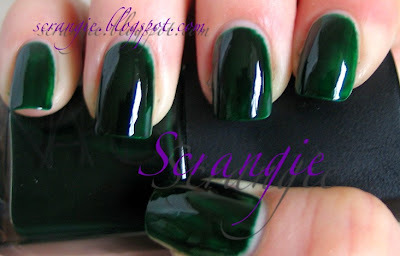 This time it's the dark blackened green from last Fall's Spain collection called Here Today, Aragon Tomorrow. Seems to be a common theme among OPI's suede polishes- looking pretty much nothing like their namesake. The finish is the full-on no shine chalky matte that I adore and it seems to stay matte much longer than I'm used to. Doesn't get shiny by the end of the day. It dries super fast. It does not wear as long as normal polish because it is a matte, but I got three days with no chips when I used this with Gelous basecoat. OPI Here Today, Aragon Tomorrow Suede with one coat of Seche Vite Topcoat. I can't handle all this awesome. Can you believe this?? 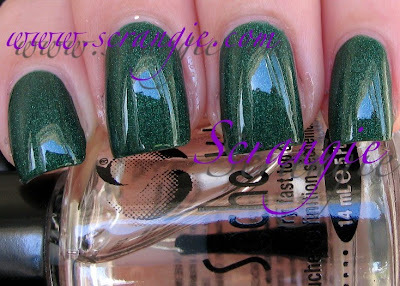 It's the most ridiculously sparkly luminous evergreen shade ever when you add topcoat. It sparkles more than most glitter polishes and there's not even any glitter in this! Must be because of all those little foil particles that OPI uses in their suede polishes. It's good matte, but it's AMAZING with topcoat. The formula was great. Totally smooth, not too thick, didn't dry too fast. Use enough polish on the brush when you apply and you won't have any problems. I did two coats here. Dry time is super fast. Wear isn't great, but it is good for a matte, I got three days before it chipped with the basecoat I used. You know what I like about this color? It reminds me of these Christmas ornaments I have. They come in frosted forest green and deep burgundy red. I hung them from the chandelier last year instead of putting them on the tree and they looked really pretty. I love Christmas, so anything that reminds me of it becomes a favorite of mine. Hell, I love every holiday so anything that reminds me of any holiday gets high praise from me. Especially if it sparkles! I haven't been taking any pictures of my makeup lately. Truth is, seeing all these macro pictures of my eyebrows made me a little neurotic, so I did something I know I should never, ever do... I sat down in front of the 16x magnifying mirror and over-tweezed my eyebrows. D'oh. So I've been growing them out again and they look really rough right now and I can't bear to look at them in macro. 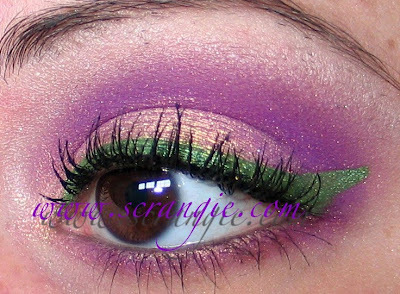 Rapunzel Had Extensions is a Fyrinnae must have if you ask me. It's just so pretty and easy to wear. Peachy-pinky gold duochrome. Very lovely. Goes well with a lot of different colors. This collection was released in 2008 but to this day, even after the dozens of new collections that have been released since then, China Glaze's Rodeo Diva remains one of my favorite collections of all time. This is what a fall collection should look like. When I posted my swatches two years ago I was so excited about these colors that I rushed and posted pretty crappy pictures. I just couldn't wait, I was so thrilled that I had to post them immediately! But the lighting was bad, my application was shaky and I had some broken nails. So, I figured it was about time I try to do these amazing polishes justice. 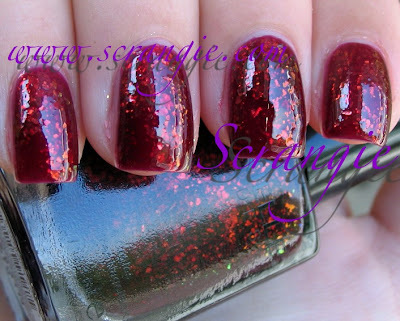 Here they are once again, the incredible China Glaze Rodeo Diva polishes. Branding Iron. 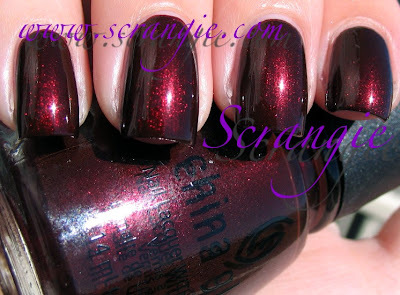 A deep blackened red shimmer. One of my favorite kinds of colors! See how it looks dark on the edges and light in the middle? I can't get enough of those colors. Cowgirl Up. 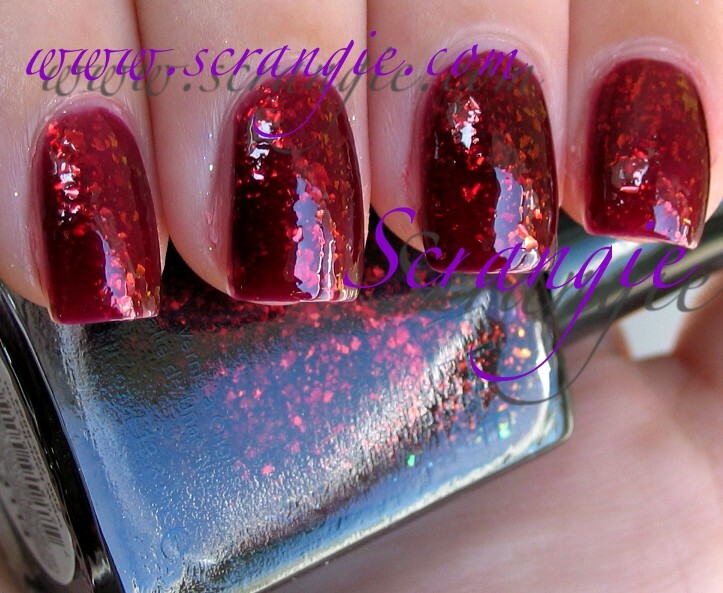 Amazing red-purple shimmer. Possibly in frost territory? The shimmer is really fine like a frost but this is just too pretty and smooth to be a true streaky-silvery frost. 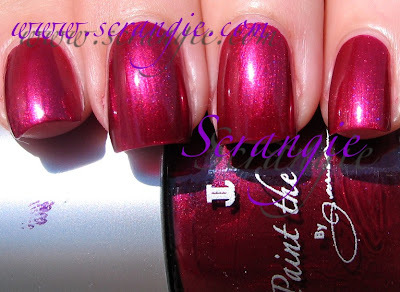 This shade looks really amazing in the sunlight, it has hidden iridescent shimmer! Golden Spurs. 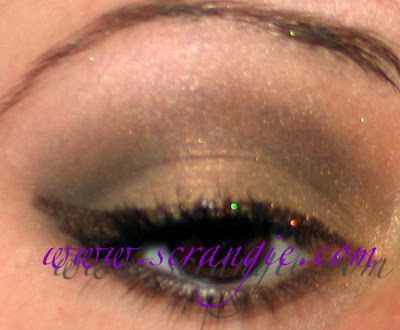 A warm light suede brown base with gold shimmer. 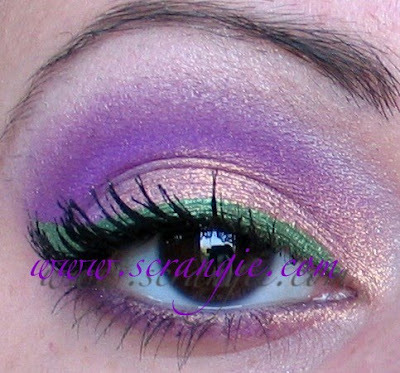 This one doesn't look that great on me but I still love the color. So much pretty gold shimmer! Gussied Up Green. I remember this being my favorite one when I first got this collection, but now I can't pick a favorite. 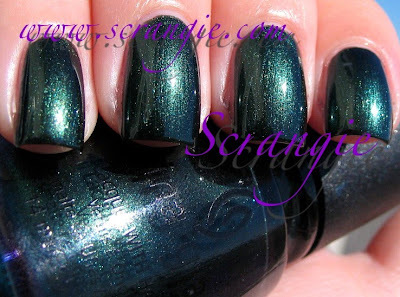 This is a blackened blue-leaning green shimmer. Very dark but when the sunlight hits it it really sparkles. Lasso My Heart. 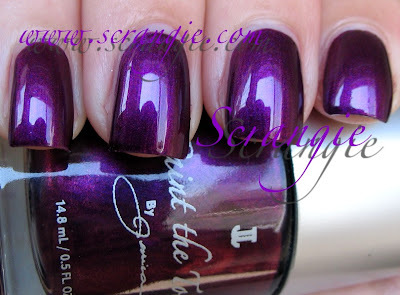 A mauve purple foil. Not as dense or silver-toned like most foils, this one is pure color and very smooth. Midnight Ride. Extremely dark purple shimmer. Dark and dramatic. Looks mostly black indoors but in the sunlight you get glints of glorious purple. Prize-Winning Mare. Similar to Golden Spurs in concept- a light brown base with gold shimmer. This one is much more shiny and metallic, though, and not as warm. 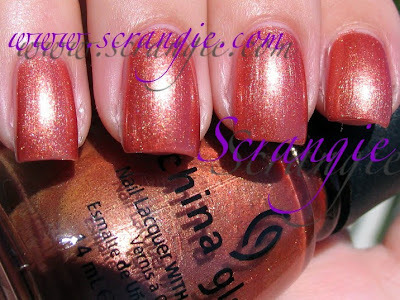 The overall effect of this one is actually more of a bronze foil metallic look than just a plain shimmer. Red Stallion. This color never photographs right for me! It's so metallic and shiny that my camera freaks out. It's a bright metallic red, very glowy, almost radioactive. Rodeo Fanatic. 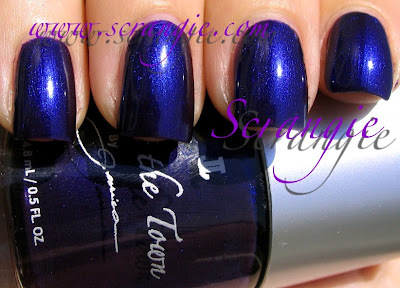 Medium blue shimmer. Seems to be a tiny bit on the teal side- doesn't look like straight pure blue to me. Maybe there's a touch of green in the formula? Side Saddle. The base of Side Saddle is a dark brown-toned plum shade. Raisin perhaps? Brown and purple, a bit like Lancome Lizzie Jagger. The shimmer in this is very shiny light gold. Wagon Trail. What a cool color. It's a black base with gold shimmer but it combines on the nail to look like a olive green. Looks amazing in the sunlight. Yee-Haw! Orangey, coral-ish pink and gold shimmer. Quite warm. Has an almost duochrome look to is because the pink-coral-peach base and the gold shimmer are each so strong that you see more gold where the light hits it and more pink where the light is indirect. 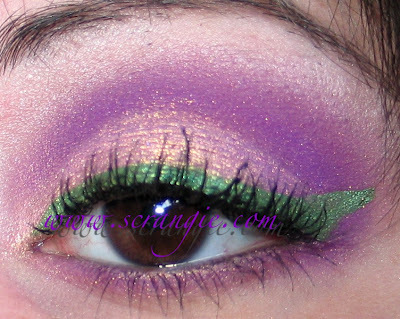 This was during the area where China Glaze's formula was on the iffy side. Runny, drippy yet thick. Remember those days? The formula on these was actually not bad, but not the easiest to control. I did three coats in all these pictures. Drying time is on the long side for some colors but not for all of them. Still love this collection... Still get excited about it every time I see the colors. Not very many polish collections have that sort of effect on me! I don't think any of these colors are particularly hard to find even though they're a few years old. I wonder if any of them have been made permanent? I'll have to find out! You know... I don't know if I've ever reviewed Zulu all by itself! I suppose that will have to wait until I'm done with this post! As you all may know by now, NARS has listened to all of us begging them to bring back the beloved green polish and has re-released Zulu along with a few others that were discontinued around the same time (like Mash and Midnight Express). My first thought when I heard that was "WOOHOO! ", but my second thought was "Oh no, I hope it's still the same." Different angle. You can see a bit of a difference in the bottle color. Flash shows a slight shade difference. The question is, "are they different?" Yes and no. For one, the new version has received a formula update and is more opaque and less streaky than the original. But, color-wise, I detect a small deviation from the original color. It's most apparent on the first coat, but the original is a more saturated color and has a touch more blue. You can see in the bottles that the original looks slightly richer and more jelly-like. The new one isn't quite as jelly-like or as rich of a green. Is it totally different? No. They're nearly spot on with only minor differences. And, unless you're like me and can see the difference between nail polishes that seem identical to 'normal' people, you probably won't even notice a difference. Especially not at three coats. You can really see the rich green base color here. At three coats it's near-black, which I love, but at two it's quite green. And yes, a bit streaky, but if you're careful and don't rush (like me, I rush, patience? What's that?) you can get a smooth even coat each time. Very happy to see one of my favorite colors of all time return. I know everyone's been looking forward to this, myself included. And it still amazes me how almost no company has been able to duplicate this color. I've seen two that are close, but one is already discontinued and very hard to find. I supposed that's irrelevant now that it's actually back!